Do you segregate player funds? Who are you, and what is SwC Poker? We are a small team of humans dedicated to building a secure, fair, low rake Bitcoin poker platform. We offer an honest, secure Bitcoin poker room. Player balances are denominated in Bitcoin, and all cash-ins and cash-outs are done via Bitcoin. No traditional currency is ever used. The organization chooses to remain anonymous. We’re committed to Bitcoin poker for the long haul. Bitcoin is a popular peer-to-peer digital crypto-currency that has been in use since 2009. SWC Poker only transacts business in Bitcoin. We make depositing and withdrawing Bitcoin fast and easy. (More information is available on our Bitcoin FAQ). What Is a Chip Worth? 1 Chip on SWC Poker is worth 0.000001 BTC. This unit is also known as 1 bit, or 1 microBTC (μBTC). 1,000,000 chips is equal to 1 Bitcoin. What are the Minimum Deposit & Withdrawal Amounts? There is no minimum deposit. All deposits are credited, down to the smallest unit of Bitcoin, 1 satoshi, also expressed as 0.00000001 BTC or 0.01 SWC Poker chips. The minimum withdrawal amount is 500 chips. The exact Bitcoin network fee is deducted from withdrawals. Deposits are credited after just 1 confirmation on the Bitcoin network. The time for this is variable, but averages 10-30 minutes. Withdrawals are processed regularly, averaging 3-6 hours. On rare occasion, withdrawals may take up to 12 hours. Do you require my dox/identification? No. We at SwC Poker flatly reject the idea that an online poker room should require your personal information. We believe the online poker experience should be similar to a live cardroom, whereby players can buy chips, play, and cash out anonymously. By using Bitcoin, SwC Poker can securely, anonymously and quickly process transactions without requiring any documentation. Only an e-mail address is required to create and use an account. SwC Poker gladly accepts players worldwide. Yes. Player funds are never used for operating expenses. 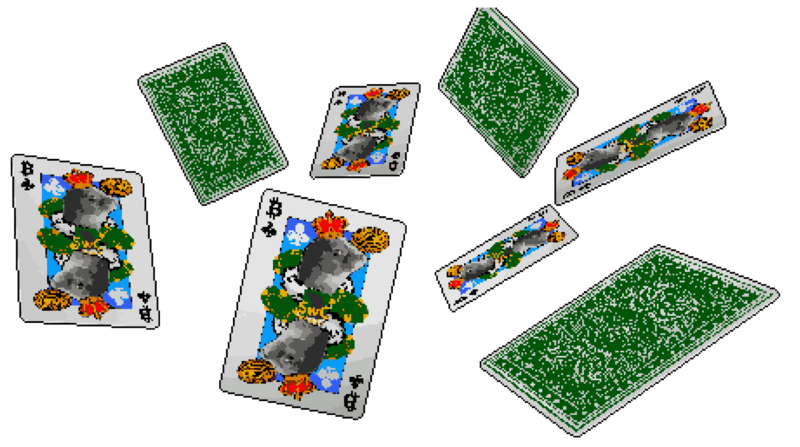 Players’ Bitcoins are held in several wallets of varying accessibility for security reasons. Do you have a player point system like other poker sites? Yes. We have a point system called “Krill.” The details can be found on our Krill Rewards Program page. How much do you charge in rake? All units shown are Chips. 1 Chip on SWC Poker is worth 0.000001 BTC. This unit is also known as 1 bit, or 1 microBTC (μBTC). No rake is collected in flop game hands that do not make it to the flop. This also applies to draw games (no first draw, no rake) and stud games (no fourth street, no rake). Our rakeback system, rewards and promotions make the rake on SWC Poker among the lowest in the world. The rake at our cash tables is periodically reviewed and adjusted to remain in line with the value of Bitcoin. An archive of past rake schedules is maintained for reference. Tournaments with a total buy-in lower than 1 chip have no entry fee. How do I know my opponents aren’t cheating? SWC Poker monitors and vigilantly fights any collusion, cheating, or otherwise unfair gameplay. Additionally, you may email support@swcpoker.eu if you observe anything you would like us to investigate. We reserve the right to handle cheating, collusion, or otherwise unfair play at our sole discretion. If you are uncomfortable with anonymous ring games, we offer heads-up tables. Sale or transfer of accounts between players is prohibited. Accounts may not change ownership. Purchasing or receiving an account from another player will result in its confiscation. Usernames may not contain vulgar terms or racial epithets. Player-to-player chip transfers are at your own risk. SWC Poker management does not intervene in player disputes related to chip transfers. Chip transfers cannot be cancelled or reversed. Please exercise caution and good judgement before performing any player-to-player transfers in an anonymous poker room. Multiple players in the same home are welcome to play at SWC Poker, but not at the same cash tables, tournaments, or sit & gos. Chat is uncensored, and is not necessarily in English. Players are provided with an Ignore option to hide the chat of any player they do not wish to see. Chat is a privilege that can be revoked by management at will. Discussing a hand in progress, revealing your hole cards prematurely, or otherwise affecting gameplay is prohibited. Spamming or flooding the chat is prohibited. Illegal, malicious, and sexually explicit hyperlinks are prohibited. Begging for chips at the table is prohibited. Gross and/or repeated violations of prohibited behavior may result in permanent loss of chat. Do not use multiple accounts to evade a loss of chat, or to chat to a user who has ignored you. This may result in escalated consequences at the discretion of SwC management. One player to a hand. Multiple players in the same home are welcome to play at SWC Poker, but not at the same cash tables. Fixed Limit games have a cap of 4 bets per street when the action is multi-way, and no cap when the action is heads up. All games have a 1 hour “rathole timer”. Players returning to a table less than 1 hour after leaving it must sit with at least the amount they left with. Using a second account to evade this restriction is prohibited. In mixed games, players are expected to play by the spirit of the game, sitting in during all game types. It is acceptable to occasionally miss a hand or a round, but it is not okay to always skip a particular game type or several game types (for example, sitting out all the stud games, or sitting out the big bet games). Management reserves the right to make decisions and potentially take punitive action in these cases. Multiple players in the same home are welcome to play at SWC Poker, but not in the same tournaments or sit & gos. You may unregister at any time before the start of a tournament and receive your buy-in back. If a tournament is interrupted and cannot be completed, management will return buy-ins or distribute the prize pool at its discretion. One account per person per tournament. Re-entering a tournament on a different account is prohibited. Bots are prohibited on SWC Poker. Please contact support@swcpoker.eu if you feel a bot is playing. Management will vigilantly defend the integrity of the games.